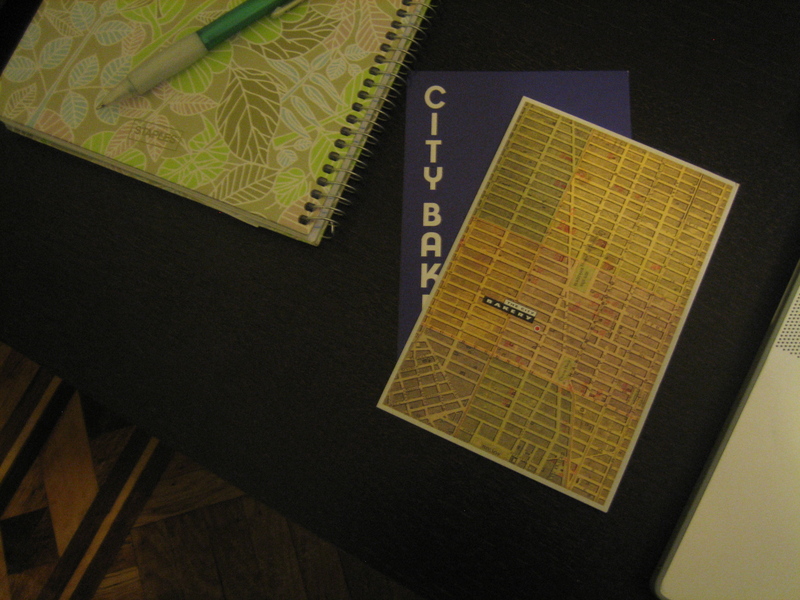 There are some places whose reputation precedes them, and City Bakery is one of them. It seemed like everyone I spoke to told me I had to try their hot chocolate. When I had been in New York for just a few weeks, they seemed tolerant that I hadn’t gotten around to it yet, but when it got closer to four months, irritation started creeping into their voices, their faces scrunching up as they asked “what have you been doing?” A few weeks ago, I was filming a short video segment for a friend in Central Park, and when I was done, the lady who was sweet enough to hold the camera for me asked, gingerly, “was that Hebrew?” I responded that it was, and we started talking. She told me how she had a menorah on her mantle, and she asked me to describe what Jerusalem was like. And Tel Aviv. And how do you pronounce it? The Golan? After which, she reciprocated by telling me all about her favorite places in New York, and right there after the Met? 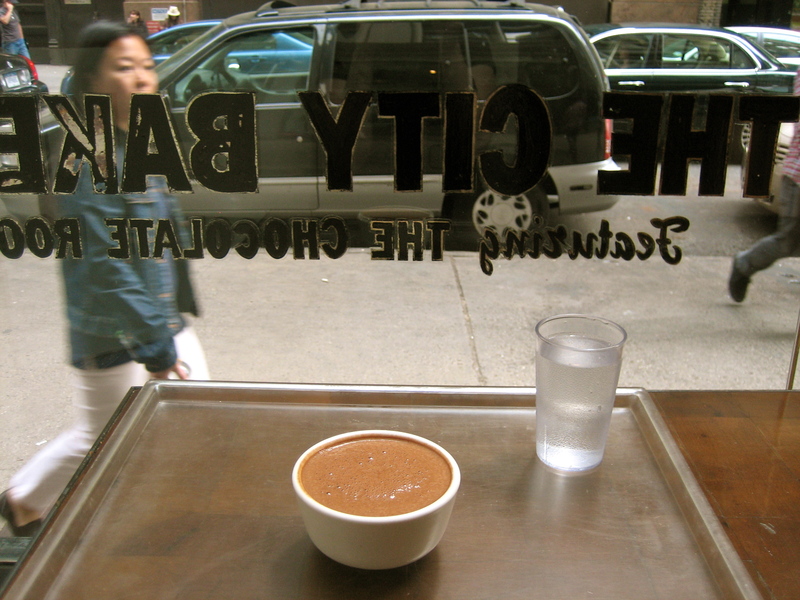 City Bakery’s hot chocolate. Back home, the internet seemed so abuzz with blog posts and reviews, that it seemed as if everyone was walking around New York with one thing on their minds: City Bakery’s hot chocolate. 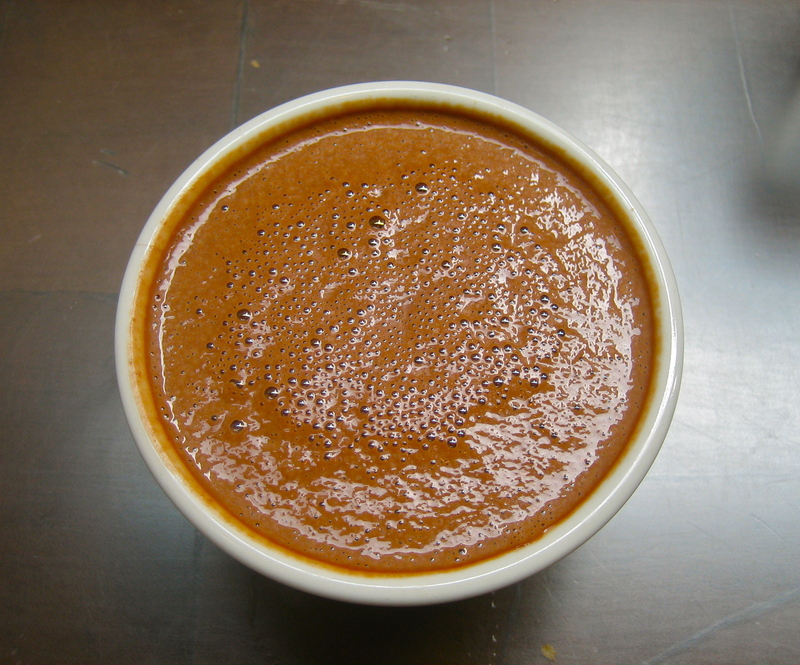 So when a friend emailed to suggest shopping and a stop at City Bakery for “the best hot chocolate you’ve ever had. ever.” My response was: yes. Fast forward to two Sundays ago, when we headed towards City Bakery, after it felt like we just could not try on another unnervingly unflattering summer dress. We walked into a space that was dimly lit, far more appropriate for, say, a bar or a romantic restaurant than a busy daytime cafeteria, and pretty drab. I had imagined a whole bakery emporium, replete with fresh baked breads and rows upon rows of confections in glass cases (I mean, look at their website), when the reality is it’s much smaller, with the second floor being seating only. The bottom floor houses a counter-top island with pastries, coffee machines and the register, towards the front, while the back has counters lined against the wall, with a self-serve display of salads and mains. There was a counter with D.I.Y. oatmeal, and D.I.Y. yogurt which looked really fun, and made me think of luxuriously lazy mornings at a hotel. 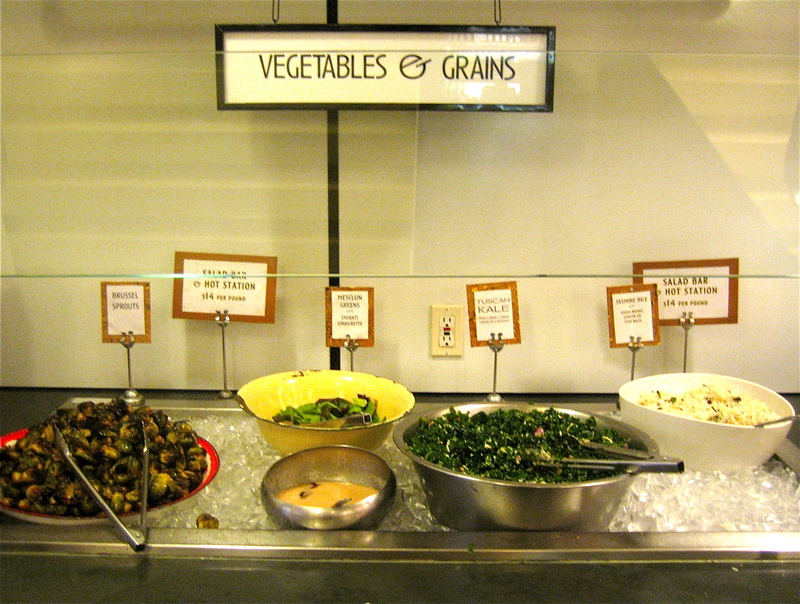 I helped myself to a tiny serving of the Kale Salad and the Roasted Brussel Sprouts, mainly because they were the only interesting-looking items in the rather sparse salad bar that everyone seems to rave about, but also because my friend warned that the salad bar is ridiculously expensive. (It is). While waiting in line to pay, we surveyed the pastries on display. The little grilled cheese sandwiches looked cute, but a little burnt, as did the puff pastry pizzas topped with roasted vegetables. We spotted soup and a variety of over-sized cookies. I found the display pretty lackluster, and not very enticing. When I ordered the hot chocolate, my friend opined that I should request it be topped with a marshmallow, to which the man behind the counter responded that “marshmallows are out of season”. Those words. Now, it’s the East Coast, and I get it, we were just emerging out of a season when barely anything grows. But marshmallows? You make those in the kitchen. If you want to have seasons for prepared foods, last time I checked hot chocolate didn’t exactly scream “spring” either. So if I’m out of season enough to order a hot chocolate in spring (I’ll admit it does sound pretty ridiculous now, but hey, summer would be worse), I’m out of season enough to top that with a marshmallow, thankyouverymuch. And for an establishment whose signature dish is the hot chocolate? To retire it’s classic garnish for half of the year? I mean guys, really. To make matters worse, when we sat down we noticed the decorations cascading down from the ceiling right in front of the pastry island were, you guessed it: marshmallows. Well, we took our seats on a long, leather-covered bench which lines the wall opposite the pastry island, with little round tabletops in front of us. Now, I’ve been told that if you have something not so nice to say it’s best to start with a compliment, so I’ll start with the Tuscan Kale Salad. This salad, with toasted hazelnuts, grana cheese and red onions, was delicious, the combination of flavors bright, zesty and fresh. The Roasted Brussel Sprouts, however, were bland and uninteresting. Too blunt? Sorry. 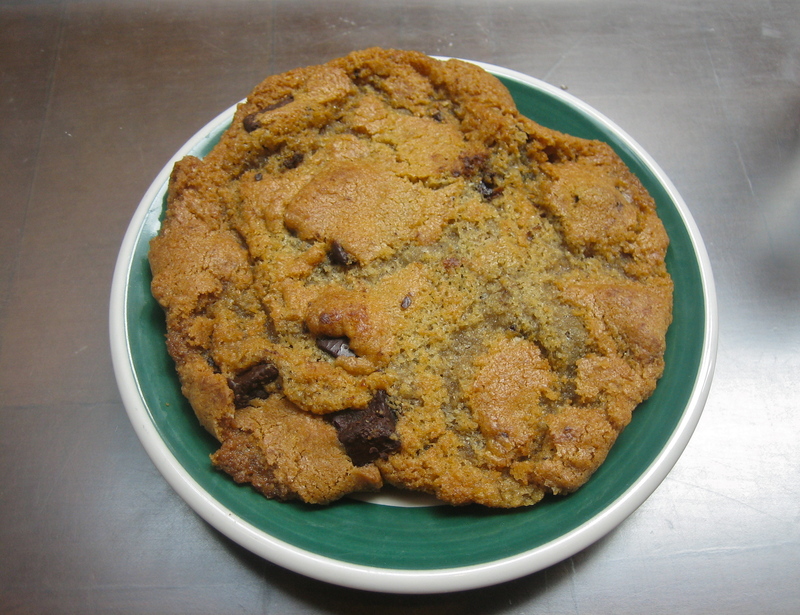 On to the chocolate chip cookie. It’s a rather flat specimen, with not much distinction between the exterior and the interior, resulting in a nice, golden bite. Not really chewy, not really soft, not crisp, but rather just on the cusp of all those things. As if, with impeccable timing, they pulled the trays out of the oven in that five-second window after and before it heads in any of the classic directions, emerging with a texture profile all its own. I know chocolate chip cookies divide people into camps almost as fanatically as politics, but I happen to like chocolate chip cookies in any form, and I enjoyed the texture of these. However, (you could sense that was coming, right?) we found it a little too buttery, the dough a little too sweet, but in closing, I’ll note one last thing in it’s favor: it was studded with delicious chocolate chunks. And now for the hot chocolate. It kind of irked me that City Bakery claimed the hot chocolate was so revolutionary on their website just because they don’t use cocoa. I might have had a particularly spoiled upbringing, because I’ve never had hot chocolate that did use cocoa. Granted they might have been the first in New York to get the memo, but they are definitely not inventing the wheel here. Not that they need to, this is an unctuous, velvety, luxurious specimen. But I have had similar, and better ones in Paris, and even in- gasp- Israel. Only this one wasn’t very hot. Maybe it was intentional, you know, another gesture to the seasons. We ordered the small size and shared it, and I still felt nauseous after. Was it delicious while I was sipping it? Yes. Delicious enough to warrant feeling nauseous after? I’m not sure anything is. Maybe it was my childhood in Paris, and stepping into Maison du Chocolat with my aunt, my gloved hand in hers, escaping the snow storm, and sitting down to a dainty little serving of hot chocolate in a gilded teacup, in a pretty tearoom with velvet upholstery and flowered wallpaper. I’m probably letting my imagination run wild here, but for some reason, that’s how I imagine hot chocolate. On a plastic tray, in a plain bowl, with no garnish in sight? Not so much. I found City Bakery overpriced, and inexcusably so given that it is self-serve, the bathrooms seem to be transplanted from a mall in the suburbs, and the overall cleanliness leaves something to be desired. Did I just go on a bad day? I think I’ll wait for marshmallows to be in season to try it again. P.S. Lest you think I’m always this negative, here’s a pretty nice review I wrote of One Girl Cookies. Enjoyed the review. I think he was being sarcastic about the marshmallows. But I agree, how can any establishment be OUT of marshmallows, especially ones that serve hot chocolate. Ridiculous!